The water temperature of Lake texoma is 64 degrees with an elevation of 619.50 ft. The past several weeks of striper fishing has been outstanding. I have mainly fished live bait the past couple of weeks with a few lure fishing trips. I would have to say at this time the live bait fishing is definately better. 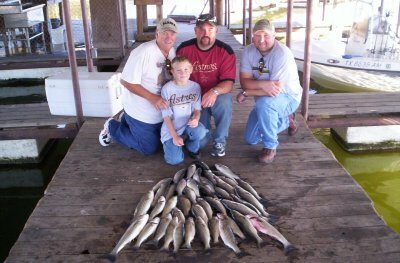 I have fished west of highport Marina and back to the north in 35-45 feet of water with great catches in both direction. We are starting to see the fish put on weight and are not catching near as many skinny fish and the smaller fish are chunks.